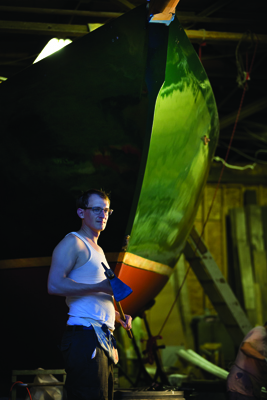 On a sweltering July night, Jonah Eaton ’02, wiry and nimble, jaunts up and down the homemade ladder leading to the deck of the gargantuan almost-completed wooden schooner he’s built by hand. The Northeast Philadelphia workshop where The Aramingo awaits her maiden voyage, awash with workbenches and shelves piled high with tools, spills light into the darkened street. Wooden planks and beams of various lengths and widths line the walls, and boxy machines with thick ductwork snake up toward the high ceiling of the former dairy building. After almost a decade, Jonah’s boat-building odyssey is almost complete. With the help of his parents, Bob Eaton ’65 and Wendy Batson, brother Zach ’11, and a slew of other Swatties, Jonah is scheduled to launch The Aramingo into the Delaware River this month. “In 2004, I quit my engineering job and started working on this full time,” says the former political science and engineering major as he wipes sweat from his forehead with a navy blue bandana. Since then, Jonah’s life has been a whirlwind of widely disparate jobs that roughly fall into two categories: day laborer and humanitarian intellectual. From 2004 to 2006 Jonah took mostly transient work—pipefitting, landscaping, and welding—all of which provided him with means, but also with flexible, much-needed time for constructing the boat’s intricate wooden skeleton. With his parents funding most material costs and a Kickstarter campaign that yielded $5,000, Jonah’s major contribution has always been his skilled and patient labor. Along the way, there was no shortage of “distractions,” as he calls them, like organizing a get-out-the-vote campaign in his South Philadelphia neighborhood and “running off to Malawi to work for the U.N.” After Malawi, where he helped develop the U.N.’s five-year plan for that country, Jonah attended law school at the University of Michigan—an interval he calls his “break” from the boat. “I sure know how to have fun in my spare time,” he says, before issuing his signature full-throated chuckle. After law school, Jonah was off to Brussels for another stint at the U.N.—a year working on refugee and asylum law, his legal specialty. 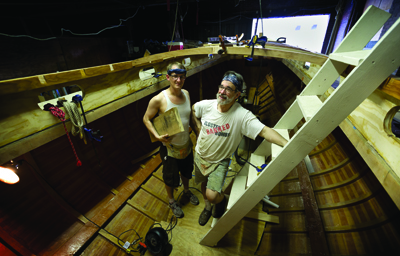 "I learned everything I know about boat building from my dad,” says Jonah Eaton ’02 of his father, Bob ’65 (right). The Eatons have made a family tradition of building sailboats, but The Aramingo is their biggest, most ambitious design yet. He returned to Philadelphia whenever possible to work on the sailboat, and the enormous vessel slowly took shape as he simultaneously built his legal career. Back injuries, workshop roof collapses, and a devastating theft of thousands of dollars worth of bronze parts from his workspace did not deter him. The 42-foot double-masted schooner’s design—based on the early 20th-century boat builder John Alden’s Malabar II—always held an allure for Jonah, who first proposed the project at a family reunion in 2003. This wouldn’t be the Quaker family’s first boat-building experience—throughout his childhood, Jonah, his three siblings, and his parents built several smaller sailing skiffs in their backyard. Nowadays, three years postretirement after a career in removing land mines through their NGO, Survey Action Center, Bob and Wendy have yet to slow down; the boat has consumed their summers, and consulting jobs on land-mine removal in countries such as Bosnia and Herzegovina continue to surface. Once the boat is launched, at which point Jonah says it will “basically be a giant motorboat,” the pair plan to take over the finishing touches at their Maine home: building the interior, masts, and even sewing the sails. Despite all of the sweat equity that Bob, Wendy, and Jonah have lent to The Aramingo, they adamantly share credit with their Philadelphia-based Swarthmore cohorts, most of whom are classmates of Jonah and his brother Zach ’11. Among them were: Alice Hershey ’02, Emiliano Rodriguez ’05, Patrick Dostal ’02, JB Farley ’01, Brandon Silverman ’02, Karina Kacala ’02, Samara Freemark ’02, and Brendan Moriarty ’04. Externs Anna Kastner ’08, Jean Dahlquist ’11, Jen Trinh ’11, and Elizabeth Rothwell ’02 also helped. The College, too, was helpful, permitting Jonah the use of Hicks Hall to run tests on his materials. Swarthmore machinists offered words of advice along the way as well. 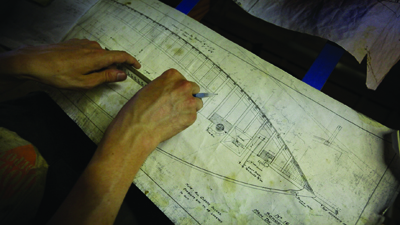 Although John Alden’s designs for the Malabar II provided a roadmap for the boat’s construction, Jonah’s engineering and carpentry acumen frequently guided him away from the blueprints and helped him devise his own improvements. “We’ve been to land-mined countries around the world, so we’d like to go back to them on this boat and see them in a different light,” explains Wendy. Bob, still busily applying the dripping white paint, is asked if this is the last boat he’ll help build. Wendy cries out before he can answer, “Oh, please!” as if beseeching the heavens: No more boats! “Oh, that hardly counts,” Wendy says, relieved. Somewhere from inside the giant boat, Jonah’s chuckle comes bouncing out, and everyone enjoys yet another good laugh. I recently started following this story and read the launch was delayed until the Spring of 2014. Is this true? If so, any update on time and place of the launch? I've been in contact with Bob Eaton ’65 who recently returned to Philadelphia with wife Wendy–homemade sails in tow–to help complete the boat. He writes, "We are committed to staying until the sucker is in the water. Jonah is working immigration law and has weekends free. We are incurable optimists and hoping for a mid-June launch." 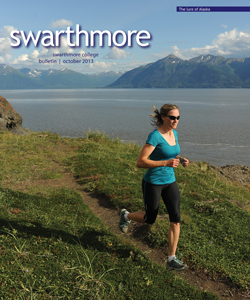 Keep an eye on facebook.com/SwarthmoreBulletin for more updates as the summer progresses.